1500 years old ruins of a Buddhist temple have been discovered in China’s largest desert, offering valuable insight for historians studying Buddhism’s spread from India to China, Xinhua news agency reported. The temple’s main hall has a rare structure based around three square-shaped corridors and a huge Buddha statue. “The hall is the largest of its kind found in the Taklimakan Desert since the first archaeologist came to work in the area in the 20th century,” said Wu Xinhua, the leading archaeologist of the excavation project. It is so far the best Buddhist site for scholars to study how the religion arrived in China from India, and its early development in the country, Wu told Xinhua. Wu, who also heads the Xinjiang archeological team of the Chinese Academy of Social Science, said it could be uncovered after two months of hard work in China’s Xinjiang Uygur region. The ruins are located in the south of the Taklimakan Desert, in the Tarim Basin, known as the Damago Oasis in the ancient kingdom of Khotan, a Buddhist civilisation believed to date back to the 3rd century BC. Temple halls with square-shaped corridors stemmed from early Buddhist architecture in India, and gradually disappeared after the Northern and Southern Dynasties (420AD-589AD), when Buddhist architecture in China began to pick up its own characteristics, said Huaian, a member of the excavation team. The innermost corridor extends six metres from both south to north and from east to west, the second corridor measures is 10 X 10 metres in length and breadth, while the hall’s wall surrounds an area of 256 square metres. Also visible on corridor walls are mural paintings of items including the Buddha’s feet, Buddhists and auspicious animals. 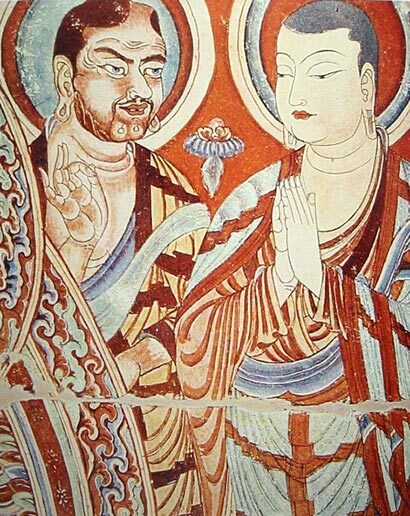 They are painted in a Greco-Buddhist artistic style, which was seldom seen after the 6th century.